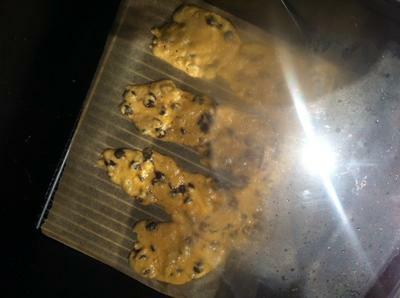 So the weather was actually nice enough to pull out my oven the other day and I was a little busy tending to other things, so I threw some cookie's in the oven on top of the little level thingy on the rack and came to check it out a little later and my cookies melted into bars!! They looked so sad and I was a little upset that I didn't take the extra time to level everything out before I started baking. Funny thing about it though, the boys STILL ATE THEM ALL!!! due to the fact that they still tasted amazing! So lesson learned. Take that extra time to make sure whatever masterpiece you are cooking is level or it will get all shloopy. Attached is a photo of my melted chocolate chip cookies. Kinda funny. I have done the same many times with cakes that ended up having a "wave" in it, to cupcakes that ran all over the place before setting and cooking and pies that ran out of the crust, as well as other foods that came out of the pots.